This is a blog that is way overdue for two reasons. Since I have committed to blogging each day, I have taken to going through my old "drafts" to see what I have started but haven't taken the time to finish. Scott and Michelle's wedding had a very unique twist to it, as everyone is aware. It had 13 children in the wedding party. I had adviser/friends who helped with decorating, and making the veil, creating the invitations, pew markers and fine & niggly details but my sister was my "adviser and idea man" when it came to the kids. She is brilliant when it comes to fun things to do with kids. When she and I were kids, we each had one, and recently we found hers in dad's treasure box. It was hilarious to read some of the funny autograph poems. and not only did she come up with great ideas for them but she followed through on almost all of them. 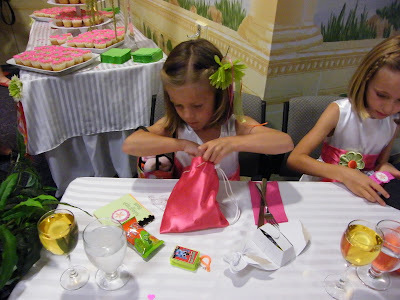 She came up with the great idea of making activity bags for the tables that the kids were sitting at. She made the little bags (her tutorial on how to make the bags is here) with left over fabric from the sash fabric. 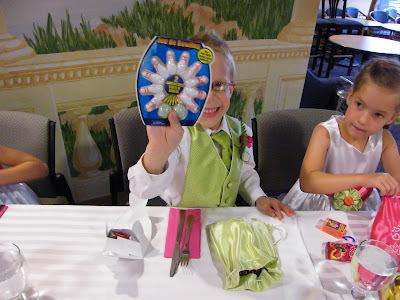 She embroidered them with "I Do" on the outside and we filled them with fun things to do. 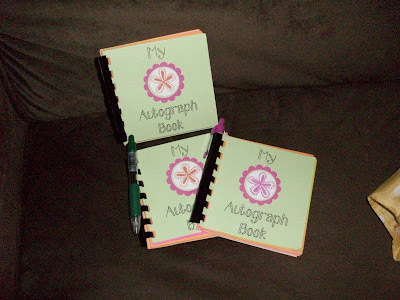 One of the ideas Gail came up with was to make Autograph books for each bag. 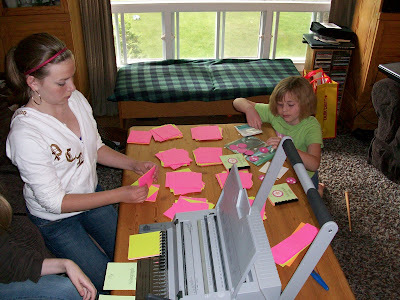 The weeks before the wedding I had three little wedding helpers that worked very hard on any task I set them too. 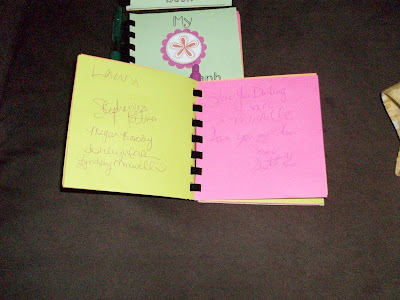 One of the big tasks on our list was to make these autograph books. First I had to find enough bright colored paper in the wedding colors of course... and that was no easy feat. Then I had to print the covers and take the paper and covers to T &S Office Essentials to do a power and precise cut of these papers into 4.25 x 4.25 squares.. 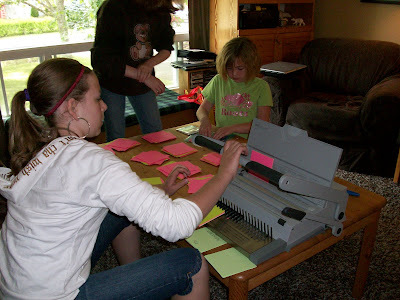 I left the rest to the girls (after a quick lesson on the binding machine from work). They sorted the colors, deciding what order and how many of each color were to go in each of 12 books (we didn't make one for Aurora). Then, the pushing of the holes.. a few sheets at a time. The actually binding was done.. and the decoration stuck on top! Gillian was in charge of that task, and it was precisely done, let me tell you. 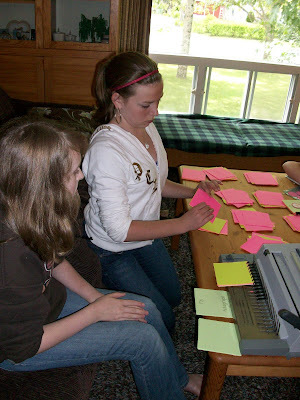 While we were planning out this whole task, we were also researching what autograph poem we were going to use when we were asked for our autographs. These are the finished autograph books. They were adorable and a big hit. 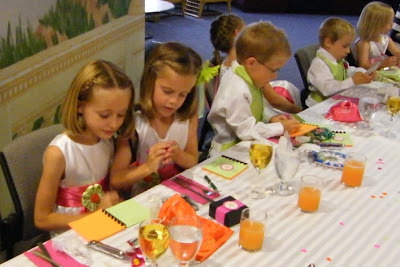 During the reception, the kids travelled all through the guests and asked for autographs. The guests loved visiting with all the kids and trying to dream up little poems for the books. Aubrey and Caleigh packed up the bags a few days before the wedding. 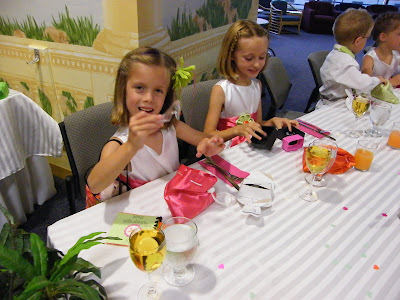 They also packed little treats in the flower girls purses. They had a blast, dividing up all the little treats and toys. The bags had a little game in each bag, a glass slipper, a little toy, granola bar, candy ring, the autograph book, a pen and I can't remember what else. 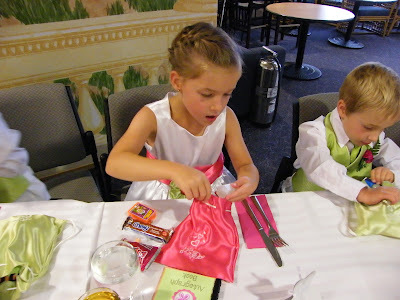 The kids really enjoyed the little "I Do" bags. And we enjoyed watching them open them and play with the treats. It kept them busy between courses of food, the speeches and the shoe game.! The autograph books were so cute and they were put together perfectly. The kids did a good job. Our kids loved loved getting the books. 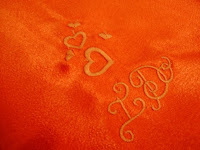 The "I Do" embroidery was just sweet and I'm glad we did them too. I agree with you, the big payoff was seeing the kids dive into them on the tables. At home, I use the little bags to put my mp3 stuff in and I know it's my design but I love the way that the little string becomes the carrying handle when the bag is closed up.